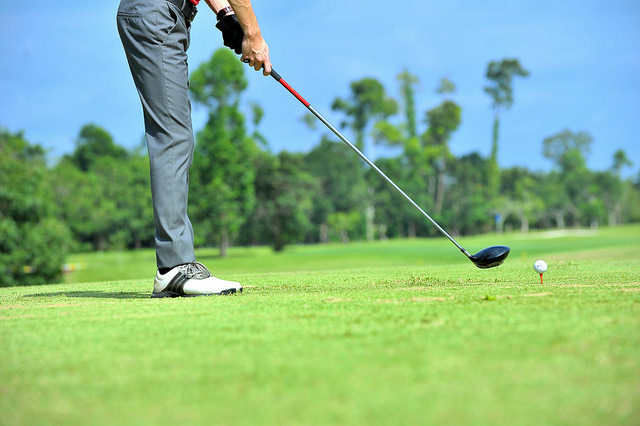 One of the most common golf-related injuries or complaints is pain at the inside of the elbow. This pain is usually localized over the bony prominence on the inside part of the elbow. In anatomical terms, this bony prominence is called the medial epicondyle. The medial epicondyle is located on the inside, lower part of the humerus (your upper arm bone). It actually forms part of the elbow joint with your lower arm bones (your ulna and radius). It is at this medial epicondyle that many of your wrist and finger flexor muscles attach. When the wrist and finger flexor muscles of golfers are overworked it is possible to experience pain at this region. The pain is usually due to finger and wrist flexor tendons becoming aggravated and inflamed at the medial epicondyle. If you are experiencing this type of pain, you may have what is called medial epicondylitis (itis meaning inflammation). The pain is usually aggravated by touching the medial epicondyle, or with movements such as golfing, hand shaking, gripping objects, or turning your palm downwards. This pain may even radiate further down the forearm. If you are unsure that you have medial epicondylitis, or are not able to reproduce your pain with certain movements, it is best to get it checked out by a physical therapist or chiropractor who has a thorough understanding of human movement and exercise/sport training. Why? Because it is very well possible to have referred pain into this region with the origin coming from a distant location, most commonly from the cervical spine from a disc herniation, or from aggravated superficial cutaneous nerves (nerves within your skin) somewhere along the kinetic chain. While historically medial epicondylitis (golfer’s elbow) is referred to as an “overuse injury,” I want to challenge that connotation. As a population, we are actually very sedentary individuals. And for the most part it’s because we neglect strength training and “accessory work” to build the strength and resiliency of our forearm flexor muscles we need. For the most part, we do only what we find enjoyable, such as golf, and nothing else. And many times, we are guilty of jumping into activities without having adequate amounts of strength in our forearm muscles. So yes, medial epicondylitis is an “overuse injury,” but only because you over-stressed tissues that were not prepared for the demands placed upon them. If you had strong forearm muscles that were prepared for golfing and the demands placed on the tissues, this injury may not have occurred in the first place. What do you do to fix medial epicondylitis? Minimize the aggravating factors to decrease tissue inflammation, such as decreasing golf frequency. Stretch the wrist and finger flexors to ensure adequate wrist extension mobility. Strengthen the wrist and finger flexors to ensure adequate strength in newly acquired ranges of motion. Normalize joint ranges of motion at the elbow, wrist, and shoulder joint. Yes, you have to look at the joints above and below to see if the elbow is overworking and taking on too much stress/compensating for other joints. Continue facilitating tissue repair and strengthen the tissues even more so that the injury does not recur. Remember, tissue capacity that is greater than the demands placed on the tissue is how you mitigate/prevent injury. All of the above can be done on your own at home. If symptoms do not improve after 2-4 weeks of at-home care, seek help from your local physical therapist or chiropractor. I recommend finding a rehab professional who understands the demands of your sport, as well as human movement and joint mechanics. In most cases, golfer’s elbow resolves fairly quickly with self-care and proper strengthening exercises. However, in some more severe cases, pain relief and resolution of symptoms may take upwards of 6-12 months. In these instances, and MRI may be warranted to see if there is degeneration at the tendons and medial epicondyle. If there is, platelet-rich plasma injections may also be beneficial in conjunction with dedicated strengthening for complete healing and symptom relief.